By default, a new Music Creator project is in 4/4 time and the key of C major. You can change these settings to any desired Meter or key. These settings apply to all the tracks in a project. You cannot set different meter or key signatures for different tracks. The meter or key signature of a project can change at any measure boundary. 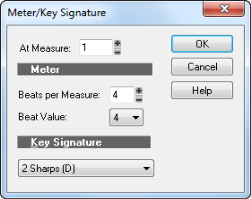 To insert changes in the meter or key signature, use the Views > Meter/Key command to display the Meter/Key view, or use the Project > Insert Meter/Key Change command. You can also click the Meter display in the Control Bar’s Transport module. If you are creating a new project that will contain only audio material (no MIDI material), you do not need to set the meter and key signature. Note: Groove clips do not follow your project's key. Groove clips follow the project pitch that is specified in Project > Set Default Groove Clip Pitch, in addition to any pitch markers in the Time Ruler. For more information, see Working with Groove Clip audio. The top number of a meter, the number of beats per measure, can be from 1 through 99. The bottom number of a meter is the value of each beat. You can pick from a list of values ranging from a whole note to a thirty-second note. Click the Views menu and choose Meter/Key. Click to open the Meter/Key Signature dialog box. The Meter/Key Signature dialog box appears. Figure 96. The Meter/Key Signature dialog box. Enter the top and bottom meter values in the Beats per Measure and Beat Value fields. Choose the key signature from the Key Signature list. You can also set the meter and key signature in the Control Bar’s Transport module, or choose Project > Insert Meter/Key Change.